Sometimes, when the sun hangs low in the sky and bunnies roam cool suburban lawns, he watches. He is neither predator nor protector. He is the silent observer of his domain. 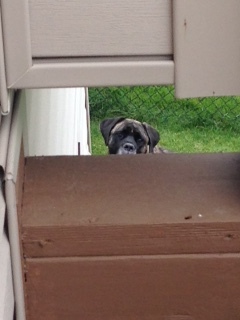 He is Boomer, the ninja mastiff. My beloved friend Shanna passed away a year ago this month. She never met Boomer, but I know she would have adored him and his ninja ways. He would have leaned on her like an oversized cat and made with the googly eyes and she would have spoiled him rotten. She had a special connection with animals, and it’s no surprise that the local animal shelter where Shanna volunteered feels her loss as deeply as many of her friends. They’ve begun raising money to create “Shanna’s Space” in her memory, and I hope you’ll check it out.